Eastern Tent Caterpillars are a native pest well known for the silk tents built by the caterpillars in deciduous trees. 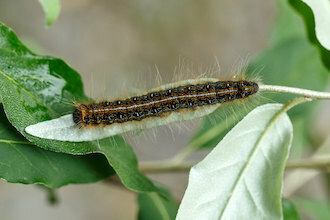 Eastern Tent Caterpillars are a native moth and while they can defoliate trees, the trees rarely die as a consequence. Eastern Tent Caterpillar Current Day Forecast. Eastern Tent Caterpillar 6-Day Forecast. Eastern tent caterpillars (Malacosoma americanum) overwinter as an egg mass. After hatching, the caterpillars work together to build their silken tent, which they use for shelter during hot or rainy weather. After four to six weeks of feeding on leaves they pupate and the adult moths emerge three weeks later. Eastern tent caterpillar population size varies year to year, with large outbreaks every few years. This species is native to North America. 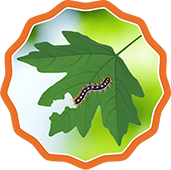 Knowing the timing of caterpillar emergence can shed light on food availability for birds as well as guide control measures. 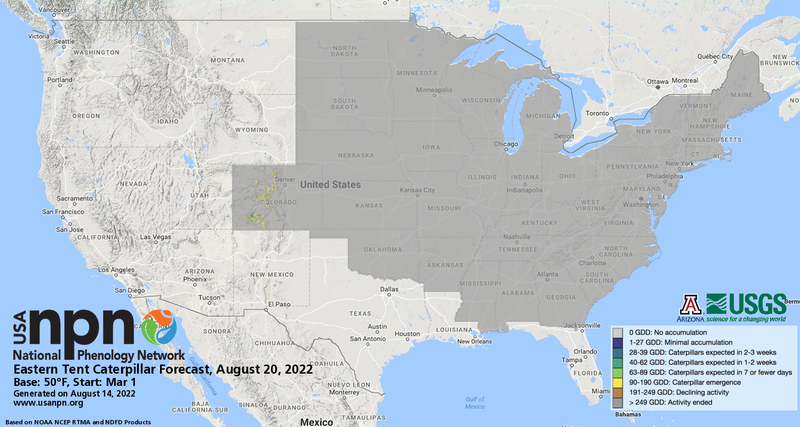 For specific information on preferred treatment options in your region, we recommend contacting your local extension agent. Additional resources are available through UMass Extension.